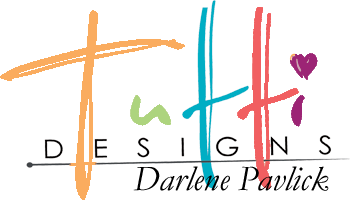 Tutti Designs: Thinking of YOU! The sentiment banner is one I had laying on my table from a previous project but thought would work nicely on today's card. I've also embossed the background panel which you could use a variety of embossing folders to create. A few steps in today's card making process . . .
After die cutting the envelope from white card stock, I colored it using my DR5 Spectrum Noir alcohol marker. Next I glued it down to a scrap of Kraft card stock and cut around the edges. As shown below, I die cut it from a scrap of white card stock then colored in the hearts (those that would pop out) and the word Love using the same DR5 alcohol marker. (sorry my camera plays tricks with pinks & reds). I've used the 'popped out' hearts as embellishment on my card and added a few of them to the center of the heart on the envelope for added dimension.